Pujo's a while away but we hear that folks have already begun prepping their wardrobes so they can hit the pujo pandals in their very best threads. We are helping you join in with this list of dresses culled from online sites. Right now these sites have blowout sales going on so why not take advantage of that? We've handpicked 6 great statement dresses in solid colours (you've heard of tonal dressing, right?). If your budget is short of a few zeroes, fret not - these are all under INR 500. But better snap these up fast as the sales will be over soon! This navy blue and red colour-blocked sheath dress with thick stripes along panels is a perfect fit for day jaunts with your gang. It has a concealed zip closure on the side, and has an attached lining. 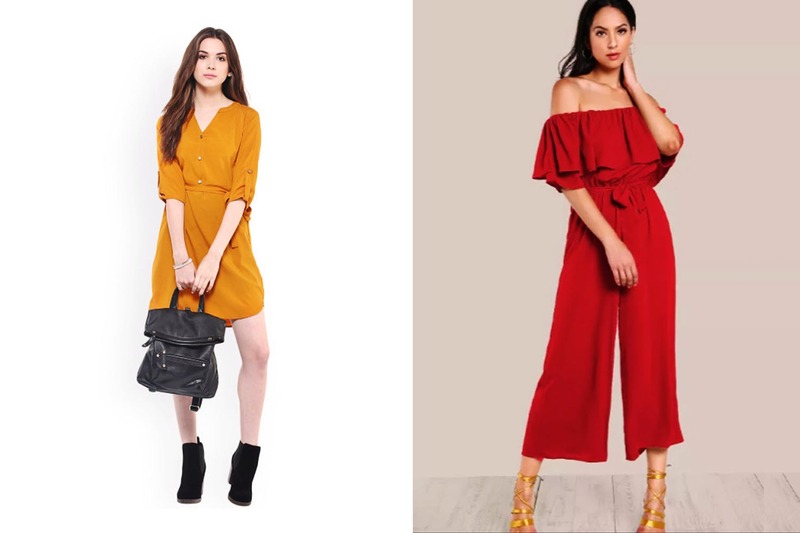 Never be the one to say no to sartorial drama - work this bold, ruffled off-shoulder dress in red in the evenings when you want to hit a cafe or restaurant for adda sessions after pandal-hopping. No need to change out before stomping around the night scene - just grab an over-the-knee boot with a thick sole and go. Switch out your boring LBD for this dusty pink number in polyester with a tie-up belt and slender bell sleeves. Pair it with bright purple pointy-toe boots and you'll ooze sophistication and elegance. Fashion pundits are calling it the “Gen Z yellow” and it's somewhere between a marigold and the shade of French mustard. Light up your daytime pandal hopping in this bright mustard yellow woven A-line dress with a tie-up detail and notched round neck. This powder blue dress in viscose Lycra is designed with a high-low hemline and has a tie-up top. Combine with box-fresh floral trainers and white leggings to add an extra bit of fun.